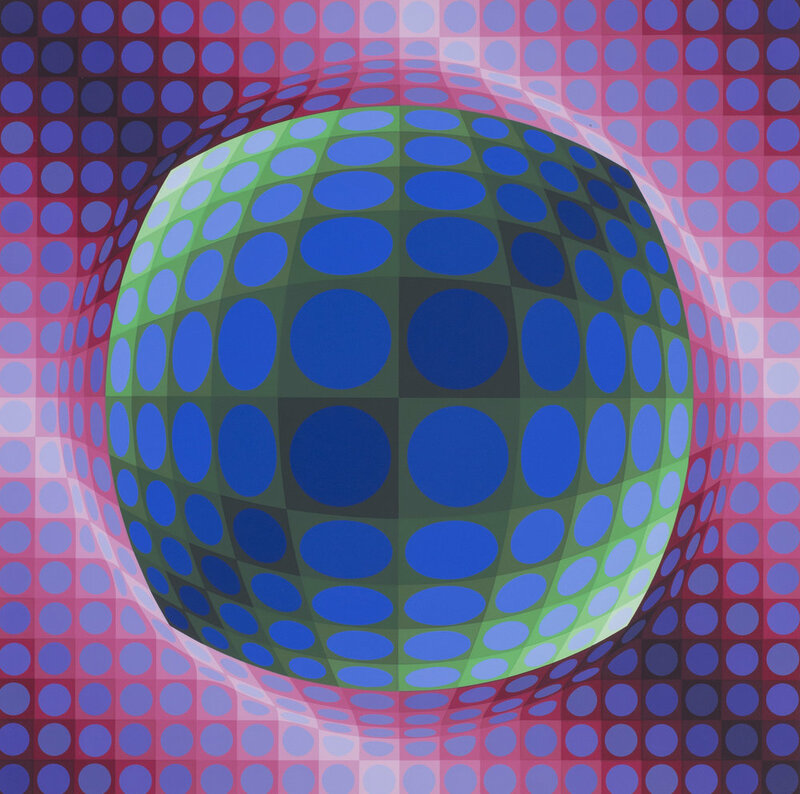 Victor Vasarely, whose original name was Gyözö Vásárhelyi, was born in Pécs, Hungary on 9 April 1908. Today, he is widely regarded as the father of the Optical Art movement. In 1927 Vasarely began his artistic training at a private drawing school in Budapest. 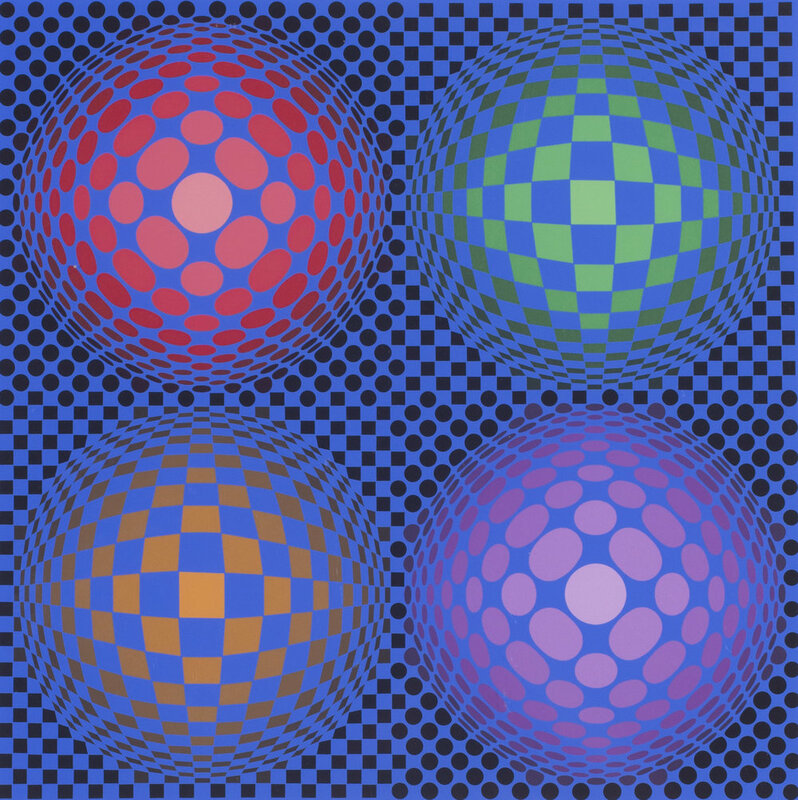 After moving to Paris in 1930 Vasarely was successful as a graphic designer and systematically explored the optical and emotional scope of the different graphic techniques. This led to his understanding in 1947 that geometric forms could evoke a sensory perception conveying new ideas of space, matter and energy. Paris was a big source of inspiration for him. In creating his first kinetic works, Vasarely was inspired by the cracked tiles of the Denfert-Rochreau metro station in Paris, and the manner in which the waves shaped the pebbles on the Belle-Isle-Sur-Mer beaches. He eventually developed his personal style by creating his own geometric form of abstraction, which he varied to obtain different optical patterns with a kinetic effect. In the artist's works, one can clearly distinguish the elements of what Vasarely used to call Alphabet Plastique, plastic alphabet: the circle, the square and their variations. Sometimes, an element of deep three-dimensionality is added to the Alphabet Plastique, so that the typical Vasarley's "impossible" volumes are created. 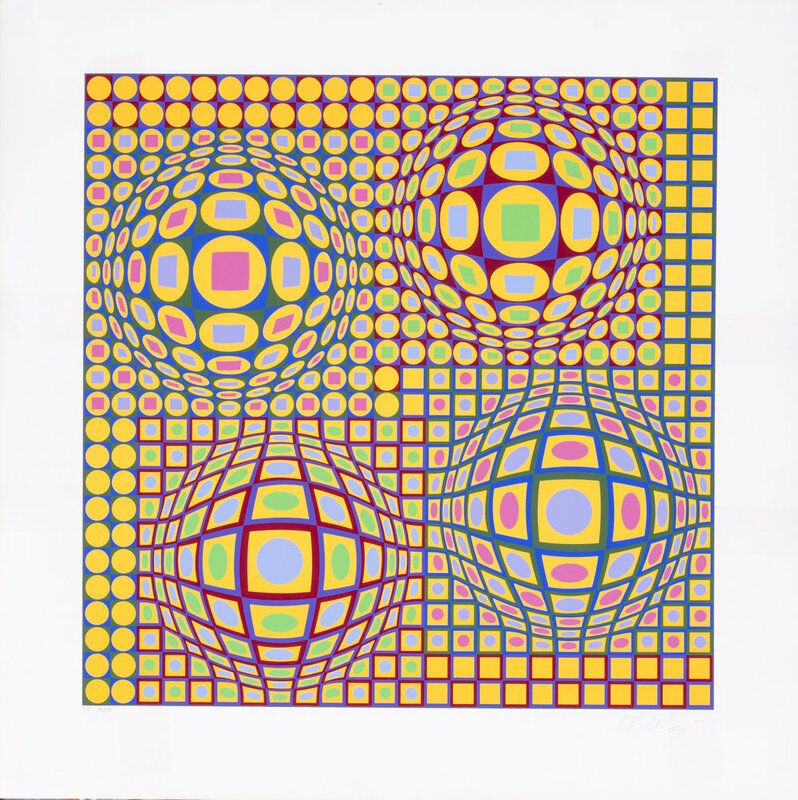 Victor Vasarely spent the course of a long, critically acclaimed career seeking, and arguing for, an approach to art making that was deeply social. He placed primary importance on the development of an engaging, accessible visual language that could be universally understood. The decoration of Caracas University in 1954 was the beginning of Vasarely's active support of art in public spaces. Vasarely designed murals of metal and ceramic, mainly for buildings in France. He exhibited works regularly at Documenta in Kassel between 1955 and 1968. The official spiral-shaped logo of the 20th Olympic games in Munich was designed by Vasarely. In 1976 the artist founded the Fondation Vasarely in Aix-en-Provence which supported the creation of an institute for contemporary design and architecture in 1981. The Vasarely Museum in the artist's birth-town Pécs was opened in 1976, followed by the opening of a second museum in Zichy Palace in Budapest in 1987.